Watch video to learn how Solar Powered Homes work. TerraWise has led the way in bringing Solar Powered homes to Jacksonville and Northeast Florida. The Sunshine state is the perfect place for powering homes with the sun. TerraWise makes it easy for customer to take their new homes solar and save thousands on electric bills. A Photovoltaic (PV) Solar Power system is the key to a Net-Zero Energy home. It uses solar panels on the roof to generate electricity. This turns a house into its own solar power generating station with technology that converts sunshine to electricity. In 2018 JEA launched a new program requiring solar powered home systems to include batteries to store excess solar generated electricity for use after dark. Homeowners may even generate more electricity than they use allowing them to sell the excess back to JEA and further reduce their overall electricity costs. In addition, electricity stored in the batteries may be available to power selected areas of the home in the event of a JEA power outage. Read live data from the solar array on your roof. Learn more about HERS Ratings. how a PV Solar System works. A PV Solar Power System is specifically designed for each home by the experts at TerraWise Homes and Clear Sky Solar. This takes into account the environmental aspects of the home site and other factors. The system includes the solar panels placed on the roof, microinverters to convert solar power to electricity, net meters that track the amount of electricity generated and the amount used from the JEA grid and batteries to store electricity generated from solar. During the day, when there is sunlight, the panels collect solar energy which is converted into electricity for use in the home. Excess electricity is stored in the batteries. After dark, any electricity stored in the batteries is used in the home. Any time the home energy demands exceed the available solar generated power, electricity is automatically drawn from JEA. The home has meters that monitor electricity used from JEA and generated from solar. Any excess solar power delivered back to the JEA grid is credited to the homeowner. Homeowners who do generate excess electricity and send it to JEA’s power grid will receive an energy credit that will help offset their overall monthly JEA bill. Any energy credit received will accrue through the calendar year. At the end of the calendar year, if there is a remaining balance of energy credits, JEA will pay the customer for the amount of energy credits as specified in the existing Net Metering Policy. The PV Solar Power System is tied to a website. The homeowner can access this site online via a computer, pad or smartphone to monitor power generation in real time. asked questions about solar powered homes. 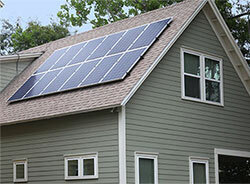 Q:How much does a PV Solar System add to the cost of building a home? A:The cost of adding solar to your home varies but generally is around $10,000. There are local power company and Federal Income Tax Credits that can help offset the cost. Q: What is the typical time to recover the cost of adding a PV Solar System? A:It is not possible to estimate the exact savings and time required to recoup the cost since many factors and variables exist for each home. However, with a Solar System, the resulting monthly electric bills are lower, at zero, or even provide credit back to the homeowner from the local electric power company. Including the solar system cost in a 30-year mortgage adds a nominal amount each month. Most homeowners will easily recover their investment well within the 25-year life of the PV Solar system. Clearly, it is cheaper to add the PV Solar System than pay higher monthly electricity bills over that same time period. Q:When does the Federal Tax Credit for solar panels expire? A:The current Federal Tax Credit, which is a 30% credit on the cost of a solar system, expires at the end of 2021. Although congress has continued to extend the credits there is no guarantee they will do so in the future. So, the best time to go solar is right now. Read more about the Federal Solar Tax Credit here. Q:What happens if there is shade on my roof during part of the day? Q:Is battery backup required for a PV Solar System? A:Yes. With new JEA Distributed Generation Policy enacted as of March 31, 2018 batteries are needed as part of the PV Solar System. As noted above, this provides the added value of having a battery backup in place if the power goes out. A:Customers that add a PV Solar System with a Solar Battery are eligible to receive a rebate of 30 percent of the cost of an energy storage system, up to $4,000. This is in addition to the federal tax incentive. Q:How many solar panels does a home need? A:The number of panels depends on many variables for each home. TerraWise does a detailed analysis to determine the number of panels required for every homeowner electing to add a solar system. 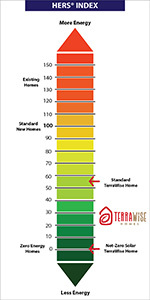 A TerraWise Home typically will require fewer panels than comparably sized homes by other builders due to the inherent energy efficiency designed into every TerraWise home. Q:What is a Grid-Tied System? A:Grid-tied solar systems link directly through your electric meter back to the power company and electric grid. This is achieved with Net Metering, which is a special meter that is able to spin and record energy flow in both directions to track electricity used as well as electricity sent to the grid. So, if a home is able to meet its electric requirements from solar power, and there is excess unused, the meter records the amount returned to JEA and the homeowner receives credits. Contact us to learn more about adding a PV Solar System to your new TerraWise home.